Mumbai: The rupee movement can change you travel route. 2018 was not a great year for those who chose to travel overseas for leisure and education. But the rupee fall is likely to continue in 2019 as well, according to experts. “We witnessed massive depreciation of rupee during the mid-year. The rupee moved from 63 to 74 per dollar, the biggest move in rupee since 2013. Part of this is because of stronger global crude oil prices and we saw the reflection on India’s current account deficit which stood at 2.4% of the gross domestic product (GDP) in June quarter and 2.8% in September quarter. The bigger reason for depreciation of rupee was on the capital account side. While the year 2013 was completely current account problem, in 2018 we saw stress both on current account side as well as on the capital account side,” said Sujan Hajra, chief economist from Anand Rathi Financial Services. “Global liquidity condition has already changed from accommodative to neutral. The next year, it will remain neutral and not tight,” said Hajra. 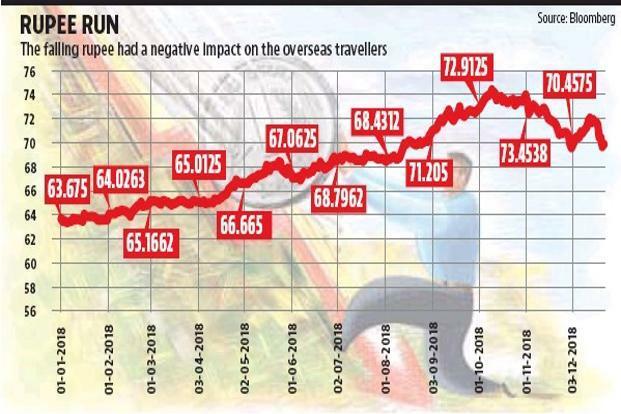 The depreciating rupee has affected international travellers but people continue to travel. “People will still travel even if rupee swings by 3-6%. The number of days for the trip may come down. For Europe, typically you will spend 15 days at least. But if the rupee depreciates by 8-10%, then the duration will come down to 7-10 days. Travellers will reduce the duration but they wouldn’t stop going to places like Europe,” said Anand Menon, vice president and head—travel tours, leisure travel, FCM Travel Solutions. The total expenditure of the trip continues to remain same. “Say if someone plans to spend ₹5-6 lakh on a holiday. The amount will be constant but the duration reduces,” Menon added. He further said that in terms of destinations, Vietnam, Cambodia, Jordan and East Europe are picking up pace. One of the major costs of international travel is the cost of your flight tickets. 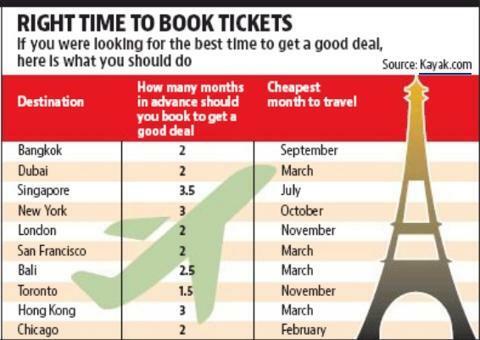 Menon said that Indians have started booking tickets at least 45 days in advance. According to Kayak, the best time to book tickets is on Wednesday at 8.30am to get a good deal. If you are planning to travel overseas, the best time to book your tickets is two months in advance before the travel date. By booking in advance, you can save 11-33% of your travel cost. The major international destinations that travellers are planning to opt for include Phuket, Istanbul and Moscow. It is difficult to predict how the rupee will move. Hence, it is better to plan in advance all your trips. You will get a better deal not just on flight but on accommodations as well. If you are planning to travel overseas next year, make it a point to save money for your travel plans. Avoid taking loans for holidays. Taking a loan can make your trip expensive. Instead start saving and put your money either in liquid funds or fixed deposits depending on the income.